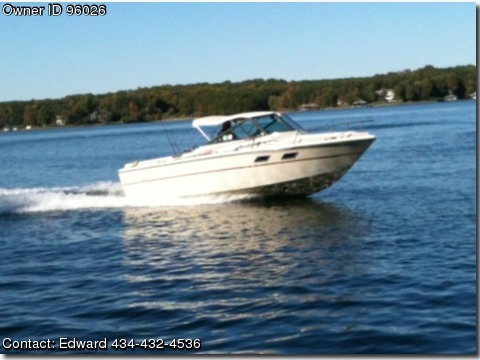 Call Boat Owner Edward 434-432-4536. This boat has been pampered & maintained & is in > excellent condition despite it's vintage.Practically all mechanical > parts have been replaced or upgraded. THe motor is a 96 ford 302 cu in > V8 with very low hours.The outdrive is OMC electric shift. That combination gives > an economical cruising speed of around 28 kts & a top speed around 40. > It's set up for fishing & watersports. For fishing, there are several > rod holders & a new Humminbird GPS/Fishfinder. For water sports it comes > with a set of skiis, an aquaplane, akneeboard & 2 tubes. Other equipment > includes AM/FM & VHF ship to shore radios, 2 anchors, extra prop all > required safety equipment. The cabin will sleep 2; includes a new > porta-potty.The trailer is a 1994 Magic tilt, galvanized, with dual > axels 5 new tires.Anyone wanting to get into boating at an affordable > price, should take a look at this one. Owner will launch and > demonstrate boat anytime for serious buyers.